“Love God Harder From Within The Red” is a large gridded painting set in the colours red, black, burgundy, green and white. 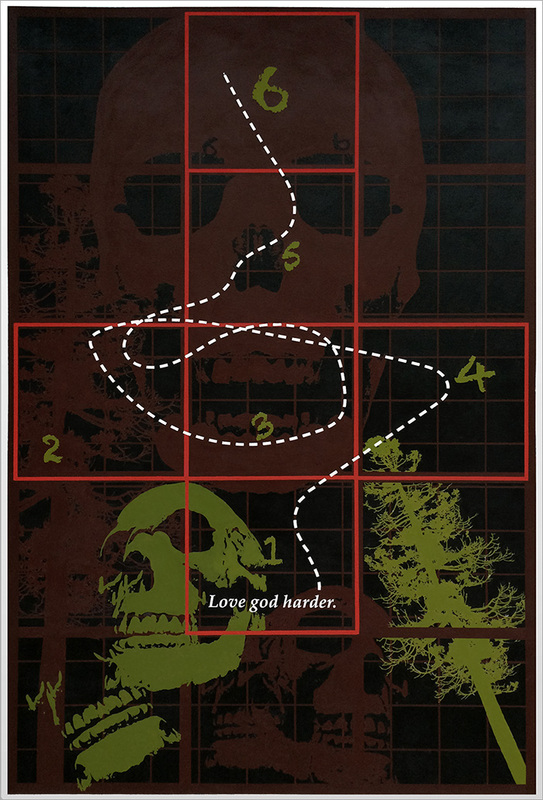 The background contains a grid overlaid with one huge dominate skull facing the viewer. Underneath are more skulls, teeth and trees. The central element is of a hopscotch pattern of rectangles outlined in red with green numbers from 1 – 6 progressing upwards in each square. The first square is numbered 1 and contains the text ‘love god harder.’ in white. This square also has the beginning of a trail of an imaginary player. This player ‘hopped’ through the course in a non linear fashion progressing all the way to the last square marked 6. “Love God Harder From Within The Red” consists of two gaming worlds. The first gaming world is represented by the background grid . The grid maps out the playing space of the ‘real’, the here and now of life, competition and death [trees, teeth and skulls]. This grid is the earth and its natural limitations that effects the freedom of all within its domain. Wether aware or not, it is this primary grid that drives the player. The second gaming world is the red hopscotch cross. That is the game of the individual separate from the surrounding environment, transforming the world according to the individuals ‘rules of play’. The rules of this game [like all games] become an artificial limitation of freedom set for playing out and indulging in individual desires. These artificial limits encourage competition and vitality of imagination symbolized by the joy of advancing ‘towards new heights’ within the hopscotch cross. To ‘love god harder’ is to progress within fixed limits, the player is the ‘god’ and the game his tool for evolution. See also: ‘Blood Inside’ (2015) by Fergal Fitzpatrick. See also: ‘The Twin Poisons of Jealousy and Success’ (2015) by Fergal Fitzpatrick.